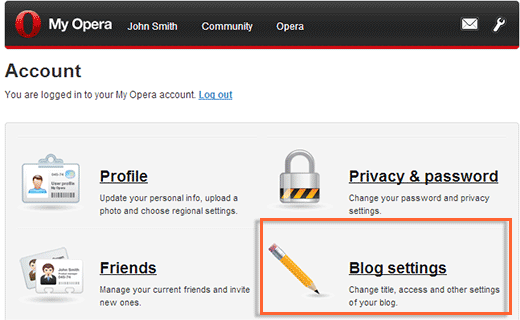 Opera web browser hosted a community feature which allowed any one to create blogs and online communities on My Opera website. Recently, they announced that My Opera is shutting down and all users are advised to download and export their content and move to other services. In this article, we will show you how to move from My Opera to WordPress. Why You Should Move to WordPress? At WPBeginner, we have helped thousands of users move to WordPress from Tumblr, Blogger, WordPres.com, and other services. When your site is hosted on a third party blogging service provider, there are certain limitations on what you can do with it. Sometimes they may even decide to shutdown the service, like My Opera did. Believe us, they are not the first one to do that, and they are not going to be the last either. This is an opportunity for you to be free of third party blogging services and run your own self-hosted WordPress site with complete freedom. A self-hosted WordPress.org site is not the same as a WordPress.com blog. We have prepared a guide for users about the differences between WordPress.com and Self-Hosted WordPress.org site. Take a look so that you can make an informed decision. You will need to have a domain name and a good web hosting company that knows WordPress. We highly recommend that you use Bluehost because they will give you a free domain and 50% off their hosting plan (special for WPBeginner users). Bluehost is also an officially recommended hosting provider of WordPress. To export your blog, you need to sign in to your My Opera account and click on the wrench icon on top right side of the screen and select Account. This will take you to your Account page where you need to click on the Blog Settings link. On the blog settings page, you will see a large blue button labeled, Export your blog. You need to click on this button to start the export process. On the next screen, My Opera will inform you that your WordPress Export is being processed. You will recieve an email notification when it is ready for you to download. You need to check your inbox for an email from My Opera. This email will have the link for your WordPress export file, which you need to download on your computer. Now that you have exported your My Opera data, the next step is to set up a fresh WordPress install on your web hosting. WordPress is very easy to install, and it only takes a few clicks. We have a step-by-step tutorial on how to install WordPress within 5 minutes. Once you have installed WordPress, it is time to import your content into your new self-hosted WordPress website. Once you have successfully installed WordPress, the next step is to import your My Opera blog into your new WordPress blog. Log in to your WordPress site’s admin area and click on Tools » Import. On the next screen you will see a list of import options available. WordPress can import data from many blogging services. You will notice that My Opera is not listed in there. That’s because your My Opera file is already in WordPress format and is ready to be imported just like you would import a WordPress blog into another WordPress blog. To begin the import process, you need to click on WordPress which will bring up a popup window asking your permission to install WordPress Importer plugin. You need to click on ‘Install now’ button to proceed. 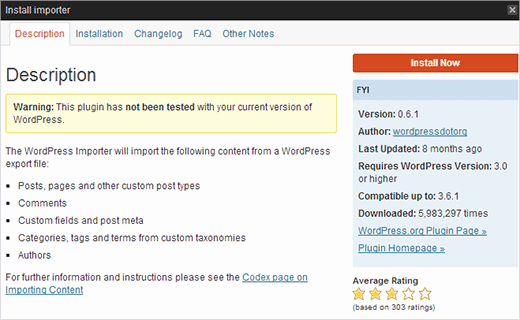 WordPress will now download and install the importer plugin. Once it is done, you need to click on Activate Plugin & Run Importer to continue. On the next screen, you will be asked to upload the file you want to import. Simply click on Choose File button to select the XML file you downloaded from My Opera, and then click on Upload file and import button. That’s all. 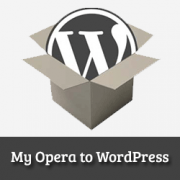 The importer will run and import your My Opera blog posts into your WordPress blog. Welcome to the WordPress community. It is an awesome publishing platform for all kind of websites. If you need any help, check out our archives. We have hundreds of WordPress tutorials written specifically for beginners. Leave your questions and feedback in the comments below, and we will answer them. If you liked this tutorial, then please consider following us on Twitter or Google+. It’s really cool that you’re doing a tutorial on this and also that opera is giving their users an export file. When I first started using opera I saw the communities and blogs and feared what would happen to peoples data if they decided to shut it down some day. Glad they are handling that well and glad you’re posting a tutorial about it. I really like opera, still using the version before they switched to the chrome engine. Dragonfly code inspector rocks!! I hope they never give that up, because it’s saved my tail so many times. Works better for me than any of the other code inspectors.